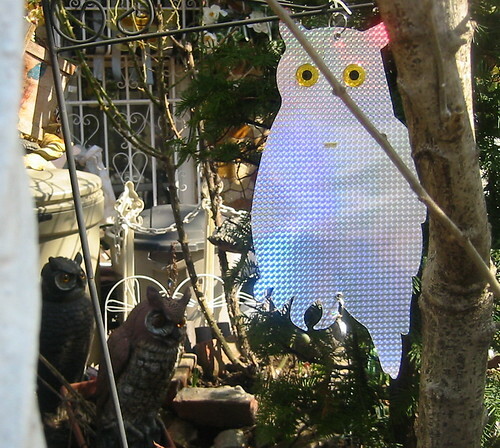 Owls on 44th, originally uploaded by bestviewinbrooklyn. The supposedly white owl caught my eye because it glinted purple, green, pink, and gold in the sun. It was only when I got up close that I saw its friends. I'm not sure if they are decorative or working owls. Would owls like these scare rats, pigeons, or bunnies away? My neighbor has two owls up because the neighbor on the other side has two bowls of bird feed on the porch which makes the birds hang out and poop all over his house.